The Smashing Pumpkins mastermind also dishes on which finish he thinks sounds the best. Billy Corgan, busy promoting the (mostly) reunited Smashing Pumpkins' new album, Shiny and Oh So Bright, Vol. 1 / LP: No Past. No Future. No Sun, recently stopped by Guitar Center HQ for a gear-centric interview. 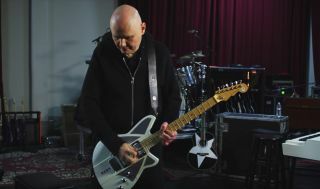 While discussing the specs of one of his Reverend signature guitars, Corgan opined on the effects of paint color on a guitar. “People think I’m a bit goofy, but I do think paint color actually changes the sound of a guitar,” Corgan said. “I’ve found through the years that certain paints sound different, so the white Reverend, I think, sounds better. I have a couple of other ones, but this one seems to sound the best,” he continued. You can check out the full interview, in which Corgan shows off the guitars in his live Smashing Pumpkins rig, below. The comments in question begin at :54.